My name is Jeffrey Merola. I am the Founder and CEO of Mouse Vacation Planning. 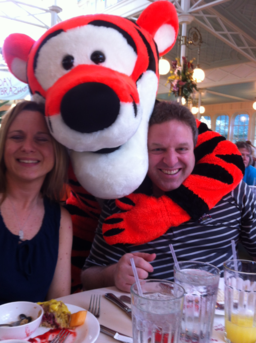 I am a husband, father, author of 10 Walt Disney World guide books, travel professional & Authorized Disney Vacation Planner, partners with BTI Travel, who is located in Syracuse, NY. I first went to Walt Disney World in 1977, when I was only 5 years old. I finally returned in February 1997. Since that return trip in 1997, I have been in Walt Disney World for more than 300 days! So you can say I have found a second home. I was a teacher for 21 years and during that time I wrote a guide book about Walt Disney World. I then created my company Mouse Vacation Planning. That was 10 years ago. I wrote a new guide book each year trying to improve on the previous book. Six years ago, while I was still teaching, I became an Authorized Disney Vacation Planner. I booked and planned trips for families as a 2nd occupation at night. Three years went by and I decided that I was going to run my business full time and leave my teaching position. That is what I have been doing ever since and it has become my passion! I book and plan trips for Walt Disney World, Disneyland, Disney Cruise Line, Aulani in Hawaii, Adventures by Disney, Disney's Resort in Vero Beach, and Disney's Resort in Hilton Head for families in the United States and Canada! I can even now book Universal Orlando and Royal Caribbean. At Mouse Vacation Planning we are committed to 1st class service to make vacations magical for all clients. The client is always first in my eyes and I will go out of my way to treat you like family. I will do everything possible to make your vacation stress free. When it comes to any Disney destination, they are my favorite destinations on the planet. I want you to receive the same experience. My family and I enjoy everything possible about Walt Disney World. We enjoy the sounds when you walk into the parks, the smells, sights, attractions, restaurants, characters, resorts, transportation, and even Disney Springs. I have written 9 Walt Disney World guide books because I want to help families plan their Walt Disney World vacations and enjoy the vacation capital of the world by getting through the theme parks stress free. My current books are the only books you will need whether it is your 1st visit or your 20th. I will take care of your Walt Disney World vacation planning! Mouse Vacation Planning in the Media! Click Here to read reviews from our clients!